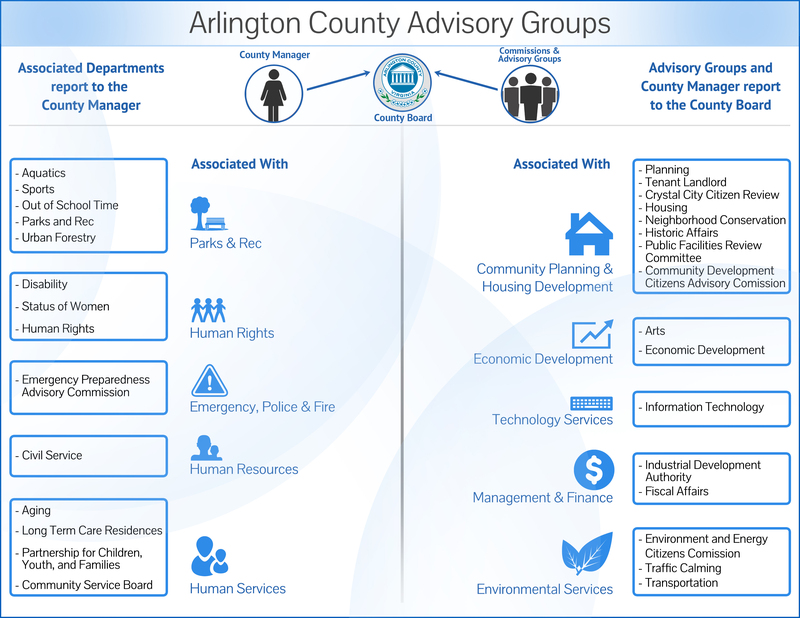 The County Board began the Arlington County Community Services Board (ACCSB) in 1968 meeting Virginia’s requirement to establish a Board of community members who play a significant role in the determination and oversight of mental health, developmental disabilities and substance use services. In 1998, the County Board designated the ACCSB as an “administrative policy community services board.” Under this model, the County’s Department of Human Services is charged with the delivery and management of services while the ACCSB retains its role in policy determination, the direction of services and as an advocate of funding needs. The County serves as the fiscal agent for the ACCSB. To learn more about the relationship between the ACCSB and the County Manager, read the Memorandum of Agreement between the Arlington County Services Board and the Arlington County Manager. The ACCSB is an active body made up of interested members of the community who are appointed by the County Board. The ACCSB meets monthly. Members also frequently participate in one of the committees established by the ACCSB that represent the major service areas. Within these committees are opportunities to provide evaluations of services and to influence budget requests or allocations. The ACCSB is composed of a Chairperson elected by the ACCSB members and as many as 17 other members. The Executive Director of the ACCSB is the Deputy Director within the Department of Human Services. County staff are frequently called upon to report to the ACCSB. Services are administered through the Arlington County Department of Human Services. Adult Mental Health Services: Provides services to adults aged 18 and older with mental illness, and their families. Learn how to access these services. Call 703-228-5160 for 24-hour access to emergency mental health services. Senior Adult Mental Health Services: Promotes and enhances independent living of adults aged 65 and older by stabilizing their mental illness or emotional disturbance. The program uses a multi-disciplinary approach to psychiatric treatment and includes comprehensive assessments, medication services, psychotherapy, case coordination, outreach and consultation. Home-based services are available. Adult Substance Use Services: Provides services to adults who experience difficulties with alcohol and other drugs and their families. Adult Developmental Disability Services: Provides services to adults aged 22 and older, and their families. Child and Family Services: Provides services to children or youth who experience difficulties with mental illness, substance abuse or developmental disabilities and their families. The Community Services Board (ACCSB) operates on a July 1 to June 30 fiscal year. For fiscal year 2018, the total budget for ACCSB-related programs was approximately $46 million. Of this total budget, local funds totaled $27 million, or 60%. The remaining 40% is made up of state funds ($13 million); federal funds ($1.5 million); and fees, and other revenue ($4 million). We value the dignity of each individual and shall proactively protect his or her human rights. All our programs and services, including those through other public, private or non-profit agencies, shall comply with the human rights mandates of the Code of Virginia. The ACCSB will create an environment that allows for full participation by each individual in development of his or her treatment and service plan. Our goal is to achieve recovery and self-sufficiency to the maximum extent possible. We shall provide opportunities for each individual to participate fully in our community, in the most integrated setting and with the maximum degree of independence possible. We consider opportunities to live and work in the community, and to benefit from the natural supports of family and friends, essential to the quality of life of each individual. Our services shall be based on “best practice” and shall strive to meet the wants and needs of each individual served. We shall provide a continuum of services that will offer flexibility and take into account the different levels of functioning of each individual. We shall serve the populations defined by the ACCSB policies and as defined by the Commonwealth of Virginia. We believe that families are the most important and accessible resource and support for individuals. We shall take all necessary and appropriate actions to maximize the involvement and participation of consumers and family members of consumers in policy formulation and service planning, delivery and evaluation. Further, we shall develop linkages for consumers and families to community-based resources of work, recreation, education, training, and advocacy. Services provided by the ACCSB shall be operated in a cost effective, efficient manner, where the quality/value of the service is high and where there is the highest return on investment. Services shall be accountable to the consumers and the taxpayers of Arlington.